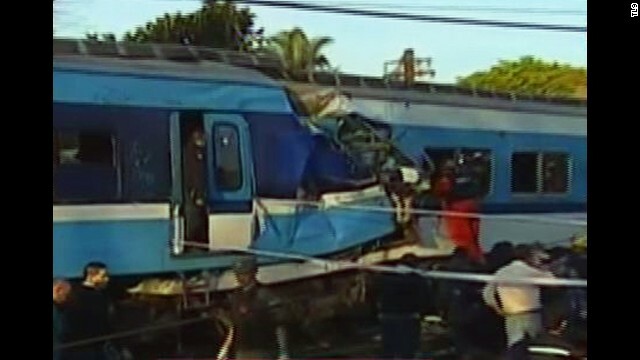 Two commuter trains collided in western suburb of Buenos Aires. CNN affiliate Canal 9 aired footage of the aftermath. NEW: Passenger: "The only thing you could here were screams"
NEW: Argentine president: "I feel anger and impotence"
(CNN) -- Two commuter trains collided near Argentina's capital on Tuesday, killing at least three people and injuring hundreds more. Rescuers rushed to evacuate people and tend to the wounded, who were lined up on stretchers near the smashed train cars. At least 315 people were hurt in the accident, which occurred just after 7 a.m. in a western suburb of Buenos Aires, Argentina's state-run Telam news agency reported. "The lights went out suddenly, and there was an explosion. I was in the last car. The only thing you could hear were screams," passenger German Garay told Telam. "People became desperate to get out. They were stepping on each other." Argentine President Cristina Fernandez de Kirchner expressed solidarity with the train crash victims and their families in a speech at an event in Buenos Aires Thursday night. "In addition to solidarity and pain, I feel anger and impotence," she said. "Because the truth is, we are putting everything (into the train system), not just economic resources and investment, but also time and human resources. When things like this happen, it hurts all of us." A preliminary investigation indicates that one train rammed into another train that was stopped between stations, Telam said. Authorities said they were still looking into what caused the collision, which occurred near the Castelar stop on the Sarmiento line. "We want to determine if it was foul play or an accident," Transportation Minister Florencio Randazzo told reporters. "If it could have been avoided, it was not accident, and there will be one or more people responsible." Transportation officials said the trains had been checked by mechanical engineering inspectors in March. Thursday's crash happened nearly 16 months after a commuter train on the same rail line crashed into a barrier at a station in Buenos Aires, killing 50 people and injuring hundreds. That crash sparked a criminal investigation. More than two dozen suspects, including former government officials, are awaiting trial, accused of mismanagement and defrauding the public. Now a government consortium oversees the train line, rather than a private company. But family members of victims of the 2012 crash said Thursday's collision was a sign that little has changed. "It is the same and it keeps getting worse. As the days pass, the trains get older," said Maria Lujan Rey, whose son died in the 2012 crash. And government officials, she claimed, continue sending trains to corrupt companies for repair. "So what do you think could have changed?" she said. "Nothing." Journalist Ivan Perez Sarmenti and CNN's Miguel Escalona contributed to this report. With the discovery of debris from the AirAsia plane, investigators move closer to discovering what happened. What are the key questions, and what comes next? The growth of AirAsia has been a regional aviation success story. The reason behind the loss of Flight QZ 8501 will be key to whether passengers start to shun it, says Alan Khee-Jin Tan. They say there are no stupid questions -- but are there? How about, "Do you speak African?" The year of outrage also applies to China's Internet users in 2014. One man swims among sharks without the protection of a cage to make studio-quality, intimate photos of the sea creatures. Using a technology that has been around for 130 years, a company called Pavegen hopes to create electricity from everyday human activities. What's next for the Internet? Acclaimed scientist and fatherof the World Wide Web Sir Tim Berners-Lee shares his insights. Gone are the days of grainy phone images with the resolution of a poor imitation Monet. A chilling video shows Boko Haram executing dozens of non-Muslims. "The year in pictures" treks across the globe, looking back on the events that shaped 2014. Each day, CNN brings you an image capturing a moment to remember, defining the present in our changing world. Browse through images from CNN teams around the world that you don't always see on news reports.